I am currently sitting in the Tom Bradley terminal at LAX waiting to board my flight to Chile. I am heading down there to visit Dr. Patricio Manriquez, a Chilean researcher that is studying the impacts of ocean acidification on coastal marine species . This will be my second visit to Chile and I am really looking forward to it! For those that aren't familiar, it is a very narrow country along the west coast of South America. I will be in the Coquimbo region in the northern half of the country. 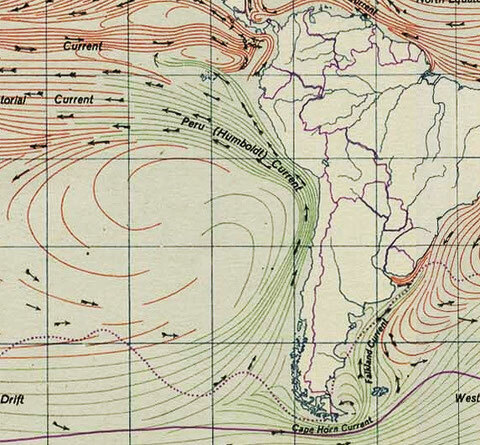 Chile has a very productive marine region thanks to the Humboldt (or Peru) Current, which flows north from the Southern Ocean towards the equator. This is very similar to the California Current, which flows southward from Alaska along the west coast of the United States. Along the Chilean coast there are large fisheries for anchovies, sardines, and mackerel, along with many different species of invertebrates. This region is also strongly impacted by El Niño events. I will try to post more information and pictures during my trip. ¡Hasta luego!